2019 Tour Programmes Now Available. 2019 Early Bird Offers Now Available. 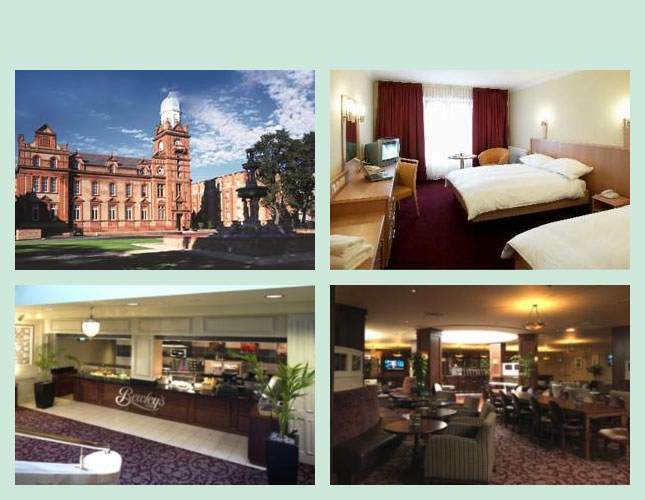 For single tour rate, please add AU$546 single room supplement to featured tour price. Your Irish trip starts at your hotel at 2:00 pm when you meet your tour guide. 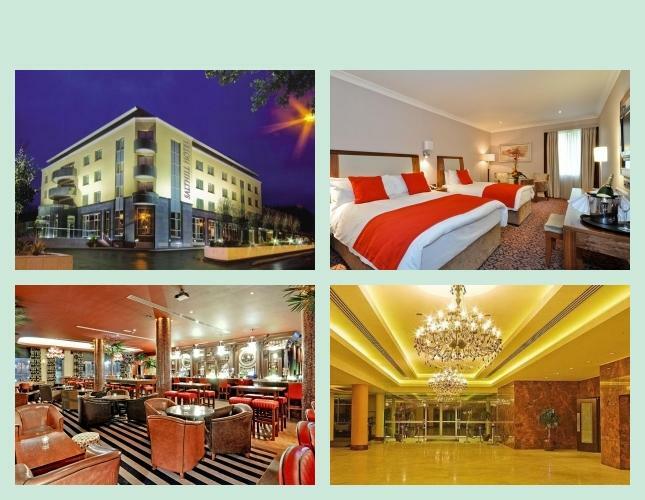 Dunboyne Castle is located 15 miles north east of Dublin Airport so ensure that you book an appropriate transfer as there is no public transportation service there. Head out to visit Malahide Castle, first built in 1185 by the Talbot family who lived there until 1975. The Castle has been remodeled over the years and today is filled with medieval artifacts and family portraits. Also take a stroll around the delightful gardens and visit the Avoca store, an Irish family-run business that spans one of the world’s oldest surviving manufacturing companies. Stop in nearby Malahide, now an upscale suburb of Dublin that still retains its village ambience. Return to your hotel for a welcome get-together drink with your tour guide and discuss your itinerary before dinner. Travel to Kildare to visit the Irish National Stud to learn about the valuable horse breeding industry and see some of the magnificent animals. 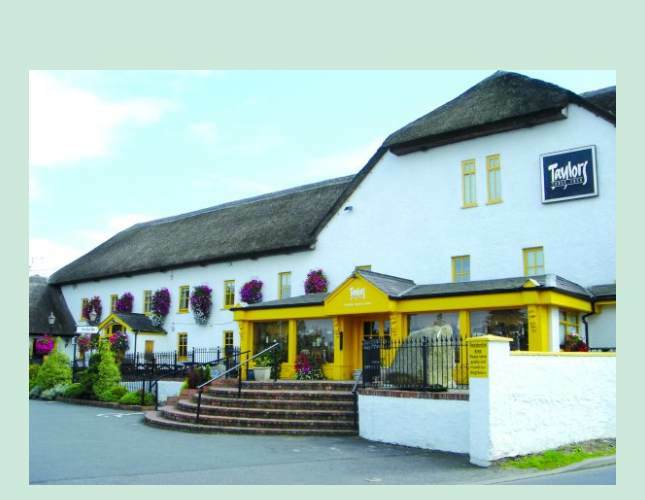 Irish people love horses and the stud is located on prime grazing lands. Take a walk around the delightful grounds to see St. Fiachra’s Garden, created in 1999 and the miniature Japanese Gardens. Drive through the Irish countryside to Jerpoint Park Farm for a light lunch and an amazing display of sheepdog skills by the trained dogs. 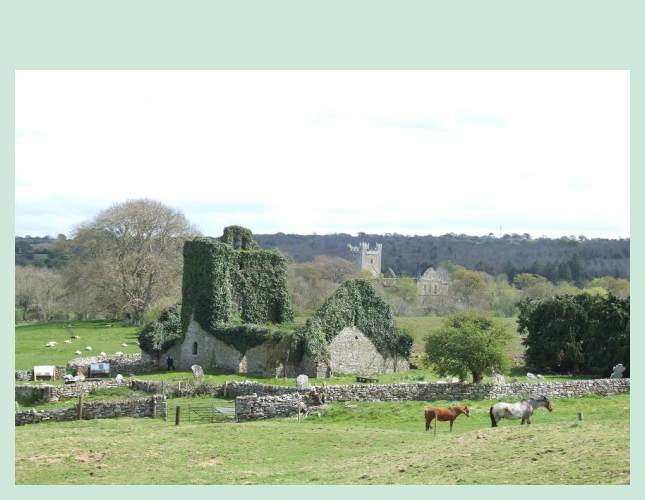 Chat with the owners and see one of Ireland’s best examples of a deserted 12th century town. Continue a short distance to Kilkenny for a walking tour along the Medieval Mile, the main thoroughfare of this compact historic city. Check in to your hotel and the evening is free for dining on your own. Choose one of the many restaurants and pubs in the city center. 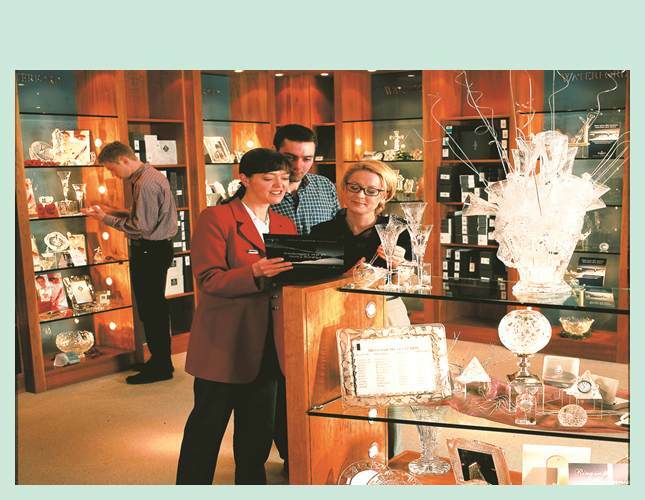 Travel south to visit the House of Waterford Crystal to see the many steps in glass blowing and cutting. Talk to some of the craftspeople as they work on one-of-a-kind masterpieces and see a wide range of trophies and tableware in the showrooms. Then join a local guide for a gentle walking tour to hear stories about the city’s long history and some of its colorful characters. After some time to browse around on your own and get some lunch, drive to New Ross to explore the Dunbrody Famine Ship, a replica of the vessel used during the 1840’s Famine to transport emigrants to North America. See the cramped quarters and difficult conditions that travelers endured for weeks on their voyage across the Atlantic Ocean. 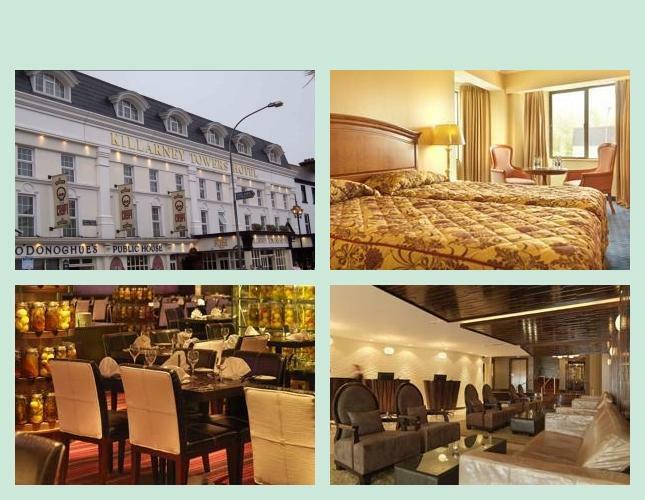 Return to Kilkenny in time for dinner in your hotel. Travel south to Cobh, the port near the city of Cork. This town is famous as the last port of call of the Titanic and many of the places associated with the liner are still extant. Visit the Cobh Heritage Centre, which traces the history of emigration over a number of centuries from Ireland to North America. Learn about travel conditions for emigrants on early sailing ships and steam vessels. At Blarney Castle climb the ramparts to kiss the famous stone and gain the “Gift of Eloquence.” If you do not wish to climb the castle, take a walk through the spacious parklands to view Blarney House, stately old trees and colorful borders. You may also visit the Blarney Woollen Mills, which are beside the castle and offer excellent Irish-made products. 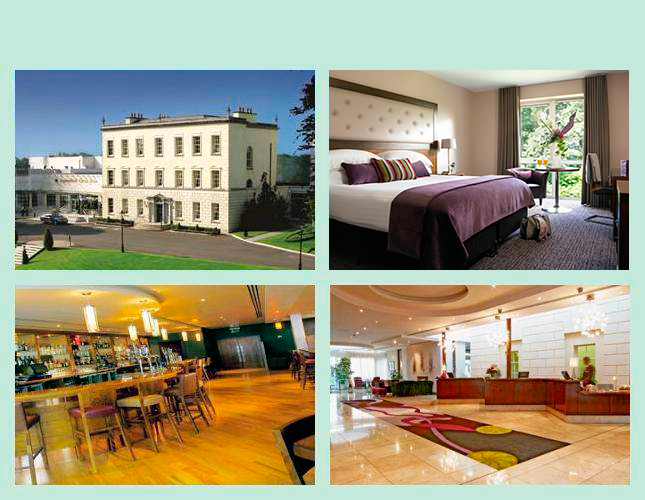 Drive through Macroom to Killarney and check in to your hotel. 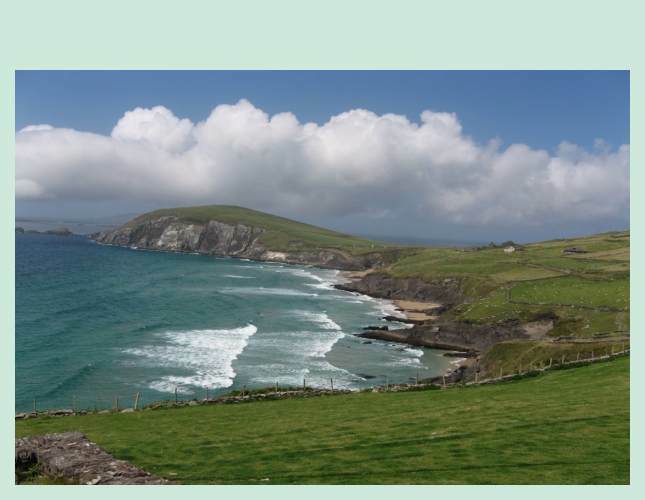 Today discover the glorious Dingle Peninsula, made famous by two movies that showcased the scenery – “Ryan’s Daughter” and “Far & Away.” Drive along the south shore to admire views of heathery mountains, sandy stretches of beach and rocky headlands. You can see the mountains of the Iveragh Peninsula to the south. 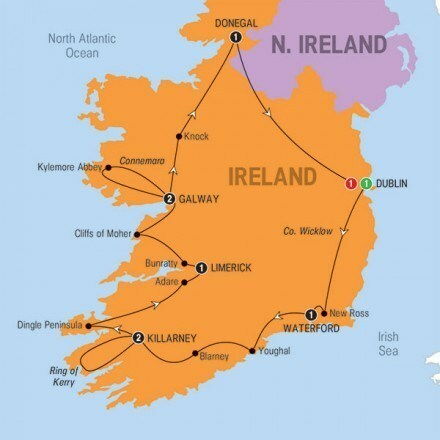 Drive to Slea Head at the westernmost tip of the peninsula and stop in the town of Dingle. 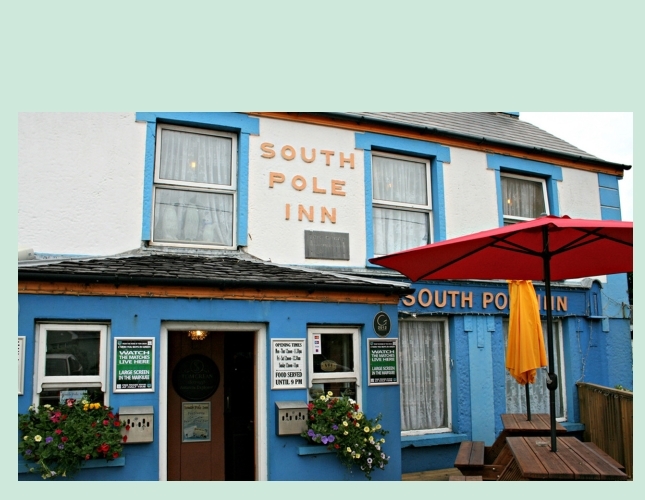 Stop at the Blasket Centre and visit the cozy South Pole Inn for an Irish coffee and learn about Tom Crean, an explorer who bravely journeyed to the South Pole with “Scott of the Antarctic.” Return to Killarney and, in the evening, head to Jarvey’s Irish Night for dinner with a fun show of traditional Irish music, song and step-dancing. Drive north through the town of Listowel, noted for its writers’ festival and literary connections, and take a 20-minute ferry ride across the wide River Shannon Estuary. 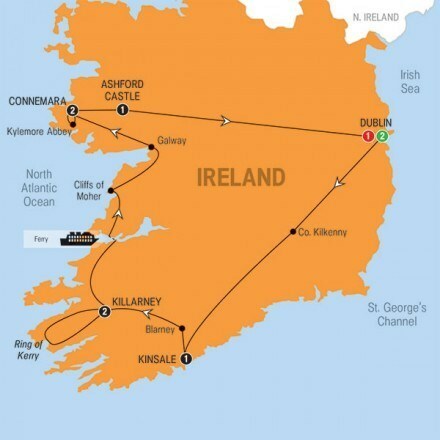 Travel along the coast of County Clare to view the Cliffs of Moher, which rise to heights of almost 700 feet above the churning Atlantic swells. Walk along the top of the cliffs to O’Brien’s Tower, located at the highest point and on a clear day you can get great views of Galway Bay, Connemara and the Aran Islands. 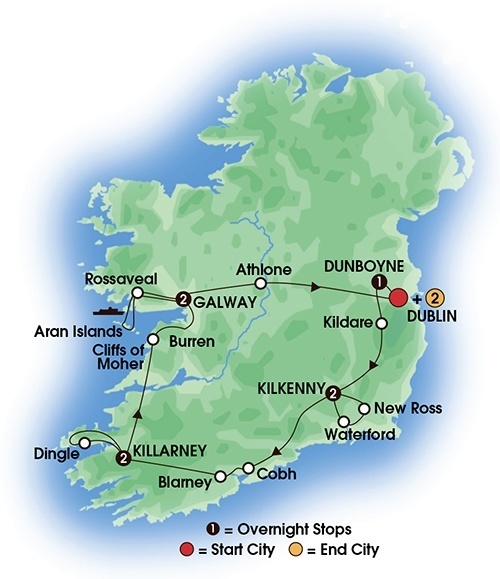 Drive through the rounded limestone hills of the Burren and around Galway Bay to Galway for a panoramic city tour. 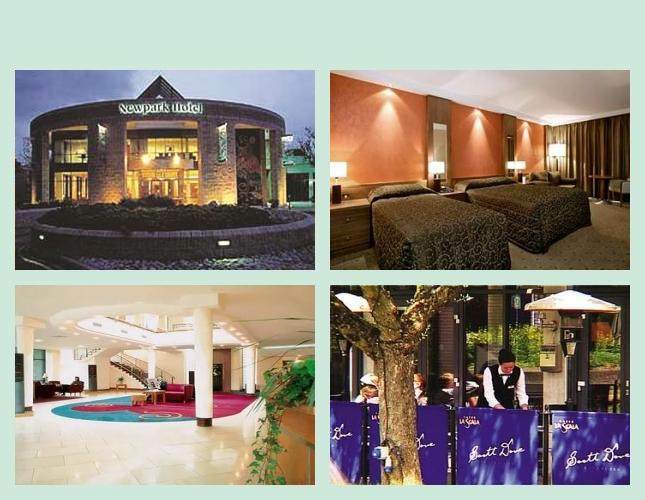 Check in to your hotel, overlooking Galway Bay and the Aran Islands. 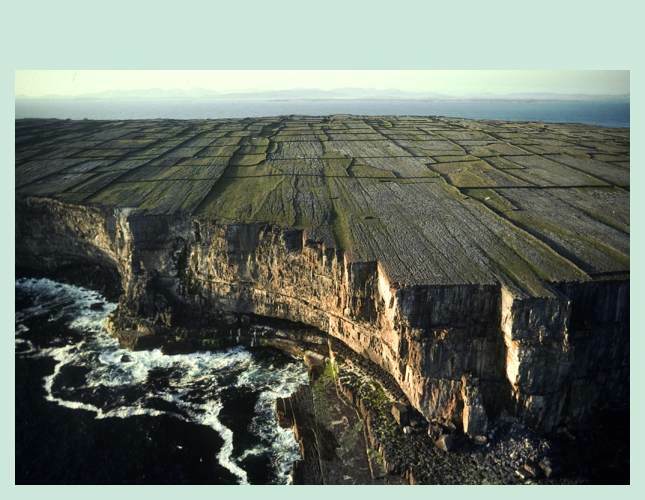 Take a short ferry ride across Galway Bay from Rossaveal to Inis Mor, the largest of the three Aran Islands. These rocky islands are renowned for the hardy islanders who maintain traditional fishing and farming methods and where the popular intricately patterned fishermen’s sweaters originated. The Irish language is still spoken widely amongst islanders today. These islands are divided up into tiny fields by stone walls but farming is difficult as the winds tend to carry away the soil. Take a minibus ride to Dun Aengus, a huge pre-historic fortress perched on sheer cliffs, which fall away to the Atlantic Ocean below. Return to Kilronan, the main town for a casual lunch, and have a look around on your own before returning to the mainland by ferry. Drive to the center of Ireland to visit Clonmacnoise. This monastic settlement was founded in 545 AD by St. Ciaran and is set on the banks of the mighty River Shannon. See elaborate high Celtic crosses decorated with biblical scenes. Walk around the many church ruins and two round towers. Head to nearby Athlone and stop at Sean’s Bar for an Irish coffee. This pub has a documented history going right back to 900 AD. During renovations in 1970, ancient walls and old coins dating back centuries were discovered. 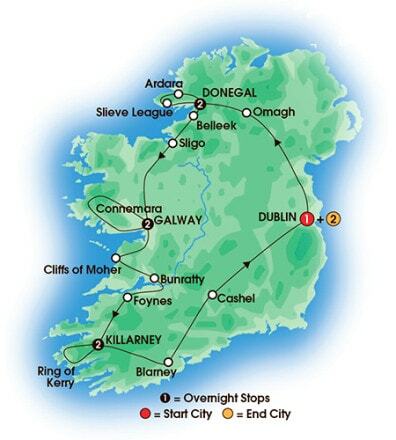 Drive to your Dublin hotel. In the evening drive to Taylor’s Three Rock Pub for a dinner with Irish specialties. 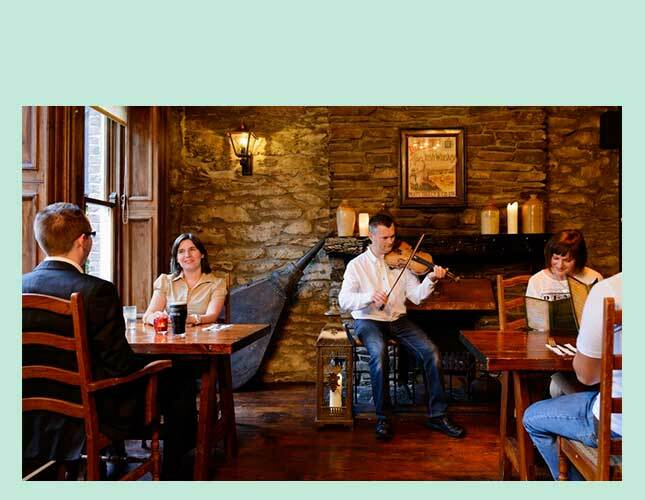 Then sit back with an Irish coffee to watch a lively show with music, songs and step-dancing. 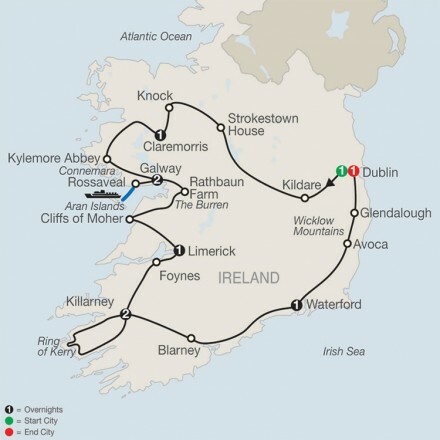 Spend an additional day in Dublin with an independent Dublin open-top bus tour (valid for 48 hours), plus a visit to Guinness Storehouse or General Post Office.